3D space is not absolute or fundamental but represents a natural, self-consistent intuitional logic of constant creation. The novelty is the application of two complementary, mutually sustaining geometries, representing two reciprocal, unbound creation spaces - one invisible and the other visible. The latter is consistent with modern physics (especially Quantum Field Theory - QFT) as well as with modern Eastern episteme, such as the microvita theory of P.R. Sarkar. Dual creation spaces or geometrized causal media - click on the resp. geometries to view in 3D. Geometry is nothing but a way to visualize how (quantum) spin is organized. To say, for example, that "the tetrahedron has 3 orthogonal spins" does not mean that there is a geometrical body spinning around its axis - it only means that there is a spin, which has a certain, symmetrical orientation with regard to other spins which is visualized, in this example, by a tetrahedron. geometries. Click to view the 5 nested platonics (aka "starmother"). - Creating new avenues for physics, education, engineering, climate science, agriculture, medical science, organisations, etc..
Why "confinement" - the main point, quite literally..
Buckminster Fuller (geometrist) introduced the notion of "synergy" but (purportedly) gave no unique explanation (i.e. in his own, unique geometric context). In quantum mechanics (i.e. "classical" quantum physics), the very existence of an underlying quantum reality was explicitly and purposefully declined, to be replaced by the (relatively senseless) paradigm of "probability". This became known as the "Copenhagen Interpretation" (but could conveniently be called the "Copenhagen Curse"). Albert Einstein was intuitively convinced that quantum physics was not complete ("God doesn't play dice") - it haunted him to his last but he was never able to solve it. In QFT (modern quantum physics) the literal concept of "confinement" is pivotal in quantum field interactions, but a) it is not thought of as acting "intelligently" (creating synergy), and b) is mathematically not fully understood. The latter is generally known as the "mass gap problem". In classical electrodynamics, Maxwell's complete set of equations contained a scalar potential, the physical meaning of which was unknown, and which was sometimes considered "magical" or "mystical". For the the sake of practical engineering, the scalar, and thus what it might potentially stand for, was worked out of the Maxwell equations by Heaviside, and this has been the textbook version ever since. Hyperbolic geometry hints at a unified approach of infinite space and the local point, but again, without introducing synergy as a logical part and/or outcome of the operations. Clearly it is not inconsistencies, rather it is the self-consistency of physics that has kept us locked in a frame of thinking under the spell of conservation laws since almost a century. The requirement of explaining what gives mass to elementary particles has led to the only real breakthrough in quantum physics in about 50 years - the discovery of the Higgs boson. Now the only thing left, at least obviously, is the unification of the Standard Model with general relativity, that is, gravity. This quest might ultimately, at least in theory, lead to a new line of thinking such as proposed in the present article. The less obvious, but far more expedient way is to follow the intuitional lead of visionaries such as Einstein, but who also present worked out, viable solutions. P.R. Sarkar's microvita theory. Micro + vita is micro life, i.e. a "single point" theorem of creating life, that is, synergy (or neg-entropy). While it represents Eastern thought, it should be noted that microvita theory is not (dualistic) philosophy, and therefore is not, and should not be explained in terms drawing from such philosophies. It appears to draw in part from ancient (Vedic) sources, although Sarkar doesn't reference those as such. In his philosophical treatise, Sarkar introduces the advanced concept of "Cosmic Nucleus", which arguably and approximately refers to the same. The text can be interpreted in the way that recursiveness or self-reference is the "characteristic bearing" and first principle of creation, and that this itself (ontologically) is, and acts as the Cosmic Nucleus. I.e. it is far from a static center - it is the only and formal actor on the cosmic stage, the very essence of all there is, and effectively it functions "ïntelligently" in all the spheres of life. A contemporary Indian scholar proposes his own unique version, in the form mathematical axioms, of said Vedic sources. This work is not in the academic mainstream but deserves recognition, if only for its sheer fervor and abundance. The author proposes various new discoveries in this field, based on aforementioned sources and his own research, with a focus on geometry, QFT and personal realization. This title is somewhat of a spoof of Gerard 't Hooft's Oppenheimer lecture, "The Higgs boson as a pivot in mass and symmetry breaking". This doesn't mean that the torus in creational geometry represents the Higgs boson (it definitely does not), but both closely relate to the current theme, that is, the role of the hidden (quantum) field, and how it synergetically impacts the known world. Moreover, whereas the Higgs boson is exclusively associated with generating the "crude mass" of particles (except photons), the torus is introduced as a pivot in far more diverse and subtle behavior of (quantum) fields, resp. their geometrical representations. Microvita could loosely be understood as a much finer form of, and precursor of the Higgs boson, acting as the quantum of synergy (complementary to the photon as the quantum of energy). The term "behavior", i.e. of the quantum fields, is not trivial. Quantum fields are highly formal and abstract, representing the function and goal of their final mundane operations as "attractors" and are therefore more or less subjective in a universal sense. Geometrically, the tetrahedron "talks with" both the invisible and visible creation spaces, sitting amidst the two wings as it were and making them just feel each other, but is itself still abstract. The real transition into physical existence is made through a dynamic interface, itself representing a still non-systaltic flow of creation. This is the torus - the universal mediator of matter and abstract. In physics terms, the function of the torus could loosely be understood as the universal form in which charge flows "intelligently", that is, non-thermodynamically, into the creation. Thus, the torus is also the one shape by which the universe memorizes itself. Pure, direct geometrical tetra-torus interdigitation. The torus in this case is composed of (1,1) torus sections, iterated 7+7 times along the circumference. A (1, 1+1/14) torus superficially looks the same, but does not register the tetra. This unique, so far purely geometrical match was discovered by the author. The physics etc. implications will need further research. The torus as an emerging topology, generated by geometrically gauging a subspace (or fermionic) vortex. The latter is a new mathematical resp. geometrical form, developed by the author, with the specific purpose to model quantum spin in a physically meaningful way. The geometric interaction between the (singular) subspace torus and the resp. visible and invisible creation spaces produces resp. 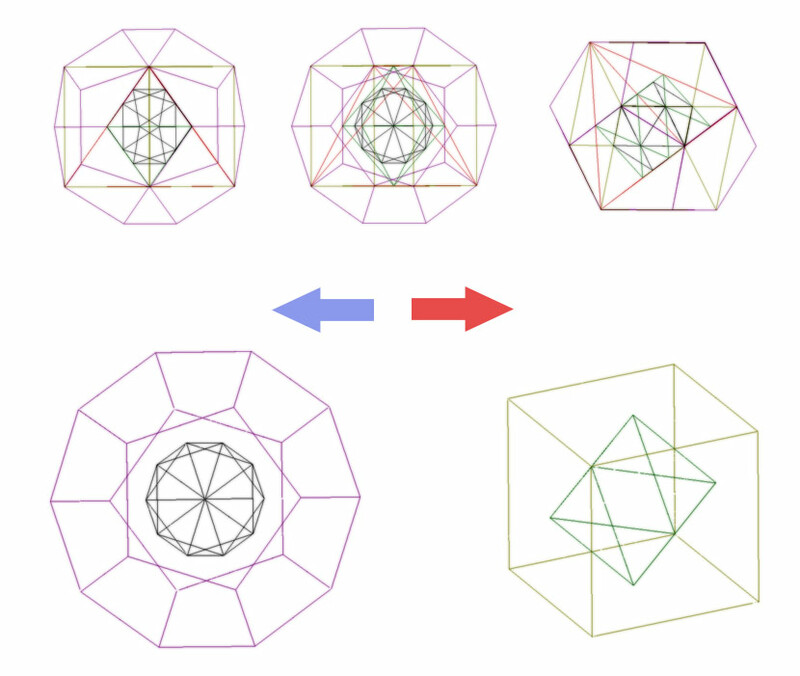 radial and axial ("inside-out") rotations, together generating a discrete, expanding series of self-looping and thus loss-less, self-sustaining toroidal topologies. The realization of 7 operators and their associated knot (i.e. from knot theory). The latter takes the 3D form of the (2,3) torus or "simple trefoil". It is a trajectory only. The "full" torus emerges as the unique topology in which the 7 operators appear as omni-connected colored tiles. 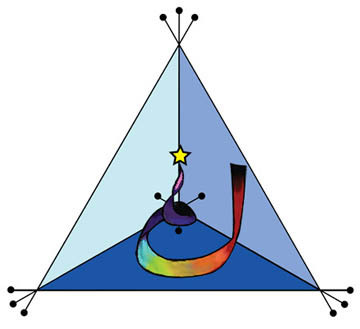 In the current geometrical context, the latter obviously represent the 3+4 spins of the tetrahedron (directly) and thus those of the dual creation spaces indirectly. It is thus effectively a matter of a functional relation of the trefoil with the formal geometries, it is not a geometrical mapping per sé - the geometry has become side lined as it were. The trefoil allready functions more or less within its own jurisdiction, forming a sequential roadmap from the simultaneous state, into a world where the immaculate geometric stratum has become utterly obscured, bound by the laws of physics. 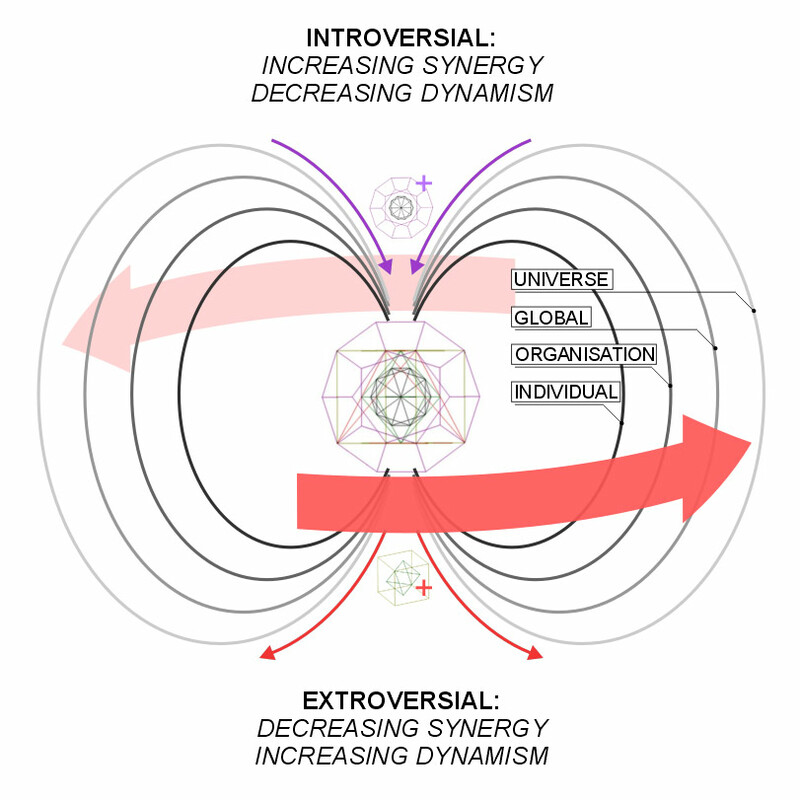 Energy is now incessantly tasked with entering back into the realm of synergy, whereas the synergetic nucleus gets enrolled in the prototyping of ever more complex structure. Objective work is being done, and so at this point we can begin to speak of the "behavior" of quantum fields. Research by Meru Institute shows how the Hebrew alphabet, i.e. the letter shapes, lie concealed within the torus topology. By taking a minimally representative slice out of a torus, just about containing its geometrical characteristics, it functions as a mold that casts a series of shadows depending on the orientation, and these shadows accurately represent the typefaces of the Hebrew alphabet. The even greater marvel is that the correct orientations are prescribed exactly by the tetrahedral spin axes. 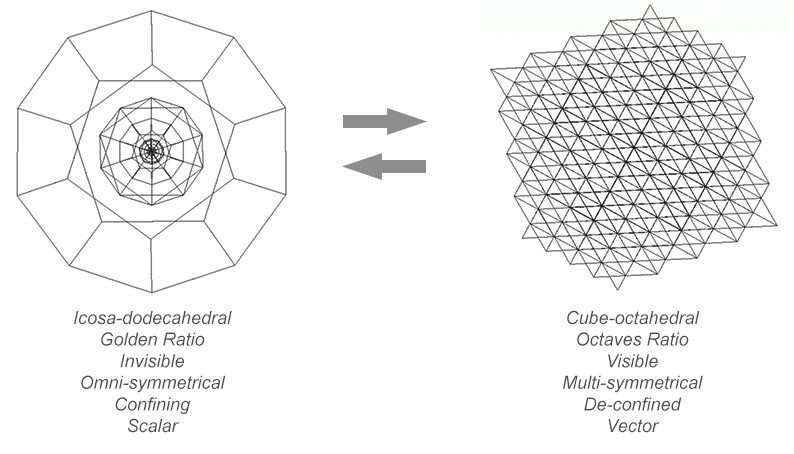 Through the tetrahedron, with its 4+3 spins, the invisible and visible creation spaces start sensing each other..
whereas 3 orthogonal spins relate to the cube-octa deconfined matrix of the Knowing (Reflection) Principle. The subspace vortex geometrically represents the intuitional logic of the path from infinite to finite. constituting the degrees of freedom of quantum fields besides spin. calculated point by point. Note the close resemblance to the Meru vortex. 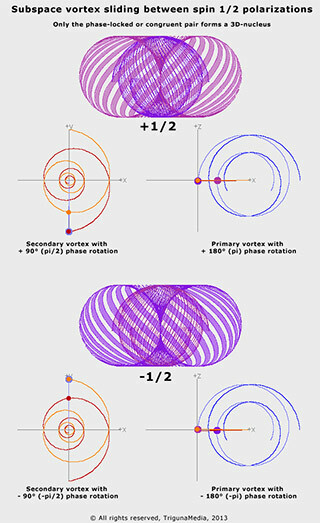 Spinor tricks: physicists attempting to visualize the Dirac spinor. Click images to view more. Accurate geometrical registration of the 4+3 tetrahedal spins on the surface of a 7+7 fold (1,1) torus. Click to view 3D model. The "Simple Trefoil" (2,3) torus navigating the 7 color map of omni-connected geometric operators. The geometries associated with the resp. invisible / confining and visible / deconfined creation spaces represent the lattice of a group theory for resp. scalar and vector field's coherent self-interaction. The symmetry axes or geometric spin angles represent symmetries in QFT. These should not be confused with quantum spin. 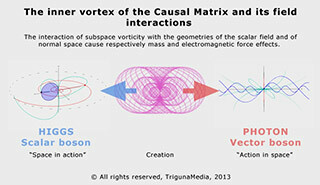 For the latter a realistic model was developed by the author, in the form of the subspace vortex. Symmetry breaking in QFT applies to the scalar field, at first so that it can have an impact and give mass to gauge bosons and fermions. In QFT this is currently done by manually adding an extra term to the field's self-interaction, creating the famous "Mexican Hat" potential well. In QFT the scalar field generates 4 Goldstone bosons. One of the 4 turns into the Higgs boson. Unlike popularized, the Higgs itself does not give mass to particles, but represents the symmetry broken scalar field. The other 3 Goldstone bosons are "absorbed" by the 3 intermediate, electroweak bosons (W+, W-, Z), giving them an extra spin. This (otherwise) plain and featureless "absorbtion" of the Goldstone modes in the EW field could be a reason why a complex, synergy-creating quality of the scalar field is largely unnoticed in QFT. Obviously this has the potential to become a new research challenge in physics. In Fuller's synergetic geometry, symmetry breaking is modeled as 4 sub-tetra's, of which 3 form a tetrahelix and the 4th. "gets lost". In the present approach, intermediate (symmetry broken) states are proposed to be latent in the allready extended cube-octahedral matrix, and are actualized or mapped through the trefoil operator. In terms of tetra-logic, it is the invisible, confining icosa-dodeca matrix, acting upon the visible, deconfined cube-octahedral matrix. Further, the author proposes a more natural and versatile QFT symmetry breaking mechanism, based on well determined scalar field excitations. In QFT, the potential well is based on excitation modes, not on actual excitations, which is a reason why the proposed synergetic action gets obscured. A new type of symmetry breaking is proposed, based on a synchronized path integral. The latter solves into a Goldstone oscillation and a vacuum expectation value (VEV), among other unique properties. 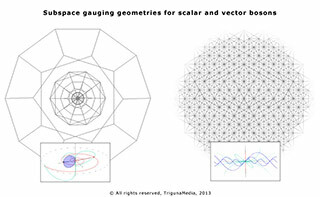 The scalar field's self-interaction is a Golden Ratio scale-invariant group effect, such as geometrically registered by the icosa-dodeca matrix. In other words, the synchronized path integral represents a deterministic approach to scalar field's self-excitation, and thus to the confined state in quentum physics. The "Geometric Origin of Color" forms direct physical evidence of the underlying dual creative geometries and their interaction. With planar angle-color arc: http://science.trigunamedia.com/geocolorlife/index.htm (drag the white dot along the color arc to adjust the cardinal angle). "CosmoLamp" color-geometry art / promotional object :http://science.trigunamedia.com/rainbow-weaver/index.htm. The Dutch (and author's countryman) Luitzen (Bertus) Brouwer (1881-1966) should be noted for his philosophy of "mathematical intuitionism", which applies to his own idea of set theory. This way he attempted to constructively introduce intuition into the very foundation of mathematics. Technically it seems reminiscent of the "axiom of choise" in nowadays set theory, and in a general sense of P.R. Sarkar's approach to microvita theory. Also Sarkar strongly emphasized the development of our intuitional powers (most effectively through spiritual practice), so that we "will know all the secrets of these microvita". Sadly, similarly to the cases of for example the later Albert Einstein and especially the later Nicola Tesla, Brouwer's strongly (intuitionally..) felt conviction that formalistic knowledge is incomplete and therefore corrupting, eventually led his career, social standing and even sanity into a downward spiral. And like in said cases, their ideas in that regard were never picked up by the establishment. In the field of topology, Brouwer proved a number of theorems, the first one being his important "Brouwer Fixed Point Theorem", which he claims is the immediate consequence of an "intuistic" point of view. Each geometrical element is emergent, pivotal, consistent and viable. With the right intention and intuition, geometry naturally works, even if not technically proven. Nonetheless a more rigid physical and mathematical basis is important and thus some mainstream and new concepts and references have been presented. 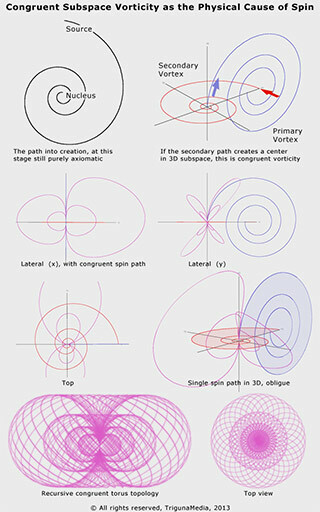 The (2,3) torus or simple trefoil was shown to represent, in one single figure, a sequential take on the simultaneous, omni-connected 7 spins of the reciprocal visible and invisible creation spaces, navigating the roadmap into - and back out of - existence. Fuller, R.B. (1975), "Synergetics - Explorations into the geometry of thinking"
Sarkar, P.R. (1986), "Microvita, a mysterious emanation of cosmic factor"
Sarkar, P.R. (1989), "Microvita and cosmology"
Kauffman, L.H. (),"Knots in the seven color map"